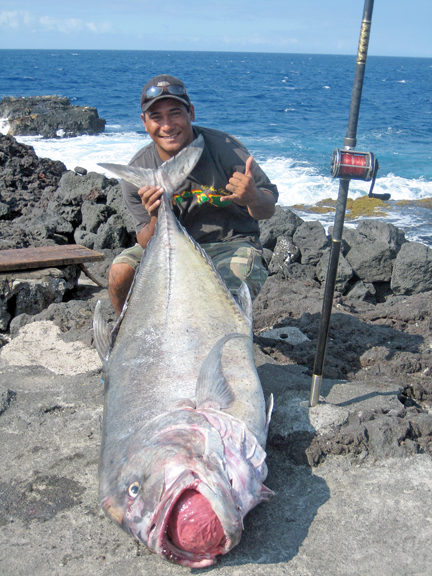 Dez Valentin was fishing in the Ka'u District with Kyle Castro and Chrystal Raquel when his dinner was interrupted by a strike on his 13-foot Tallus pole. An ulua had taken the puhi paka fillet that he'd slide. Dez battled the fish using a Newell C 550 reel until it got pinned down near shore. He slacked the line and the 136.6-lb monster floated up to Kyle's waiting gaff. Dez's ulua is a new Hilo Casting Club record! A true "big boy!"